Lovely quality 18th Century Hand Carved Frame Depicting Mary Queen of Scots. I am told she is carved centrally at the top and being the English Princess and the Scottish Queen the Scottish Thistles are carved on the left hand side and English Roses on the right hand side. Great quality and superb colour. Later glass has been added and it makes a great mirror but it is a fantastic frame or a period embroidery or tapestry. Collection or Courier UK £45 (not including Scotland) or I can possibly wrap it well in bubble and post Parcel Force 48 for £25. 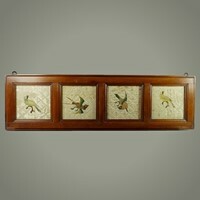 I have been dealing in Antiques now for twenty five years and "The Antique Kitchen" was started mid 2012 & is a website specialising in Georgian & Victorian Pine & Country Furniture, Treen & Quality Pieces of Kitchenalia. Most items are related to the kitchen in some way but you will find other items in the Miscellaneous section too. Based in Norfolk, I regularly source specific items for clients/TV where I have built a reputation on trust as I sell only genuine antiques. I sell no reproduction items of any kind.